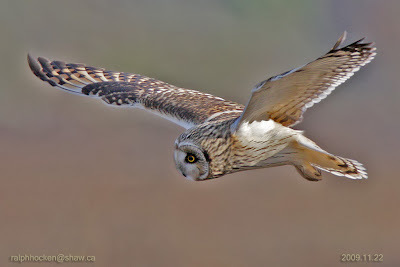 Short-eared Owl at the Nanaimo River Estuary: Ralph Hocken Photo. Three male Red-winged Blackbirds, Dark-eyed Juncos, Northern Flickers, Chestnut-backed Chickadees, Red-breasted Nuthatch, California Quail and Anna's Hummingbirds are visiting feeders in the 2500 block of Lyburn Crescent in Nanaimo. The Sunday Bird Walk went to Rathrevor Provincial Park in Parksville. We had a morning with a stiff wind off the water but sunny periods making it rather pleasant. The big surprise of the morning was when we heard and saw an American Kestrel fly from the top of a tall Fir tree. It is unusual to see an American Kestrel in forested areas. We saw eight Brant Geese near the tideline and Black Oystercatchers, Black-bellied Plovers and Black Turnstones on a narrow gravel bar. 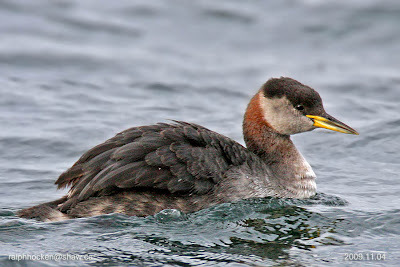 There was a Red-throated Loon on the surf not far offshore. A flock of Red-crossbills kept us looking upwards all morning. Brant, American Wigeon, Mallard, Surf Scoter, Black Scoter, Bufflehead, Common Merganser, Pacific Loon, Red-throated Loon, Horned Grebe, Double-crested Cormorant, Pelagic Cormorant, Bald Eagle, American Kestrel, Black Oystercatcher, Black-bellied Plover, Black Turnstones, Thayer's Gull, Glaucous-winged Gull, Northern Flicker, Common Raven, Chestnut-backed Chickadee, Red-breasted Nuthatch, Bewick's Wren, Winter Wren, Golden-crowned Kinglet, Ruby-crowned Kinglet, Varied Thrush, Spotted Towhee, Song Sparrow, Dark-eyed Junco and Red Crossbill. A Nashville Warbler was seen in a backyard in Columbia Beach. Hundreds of Barrow's Goldeneye were seen along the Nanaimo River. Four Short-eared Owls and several Western Meadowlarks were seen on the Nanaimo River Estuary in south Nanaimo. A Palm Warbler was seen with a Yellow-rumped Warbler at the Nanaimo River Estuary in south Nanaimo. The Palm Warbler was seen along the long Hawthorn hedgerow to the right of the tall Oak Tree. The Tuesday Bird Walk went to Rathtrevor Provincial Park in Parksville. The morning was cloudy and the winds off the water were brisk. The highlights of the morning included watching three flocks of Greater White-fronted Geese and one flock of Snow Geese as they flew high overhead heading down the Island. We saw one lone Brant Goose in with a flock of Mallards near the shoreline and two other larger flocks over the water. 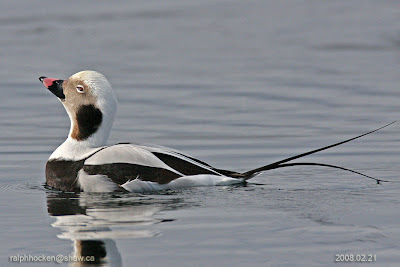 Bufflehead, Horned Grebes, Common Goldeneye, Common Mergansers, Red-breasted Mergansers, Pacific Loons and Common Loons were further offshore. We watched as eight male and female Purple Finch and three Varied Thrush ate the berries on a low bush near the marsh area. Ruby-crowned Kinglet, Varied Thrush, Spotted Towhee, Fox Sparrow, Song Sparrow, Dark-eyed Junco, Purple Finch and Red Crossbill. all areas. Count birds at your home feeders or join a small team in the field. Contact Rhys Harrison--rhysharrison@shaw.ca or (250) 468-5466. Monday January 25, 2010 @ 7:30 pm. The Tuesday Bird Walk on December 01, 2009 will be going to the Shelly Road side of the Englishman River Estuary in Parksville. Meet at the Parksville Beach Community Park near the parking area at the Lion's Playground at 9:00 A.M. or at the Oceanside end of Shelly Road at about 9:10 A.M. The Sunday Bird Walk on December 06 will be going to the Nanaimo River Estuary in south Nanaimo. Meet at the Birdstore at 9:00 A.M. or at the end of Raines Road at about 9:30 A.M. .
Park in Port Hardy on Sunday November 22, 2009. Red-necked Grebe: Ralph Hocken Photo. The Sunday Bird Walk went to Neck Point in Nanaimo. Check Shaw Cable channel 04, on Tuesday November 24, in the evening, for coverage of this birdwalk! The morning was cloudy, the winds were calm and the tide was high. The highlights of the morning included seeing three Pelagic Cormorants, a Great Blue Heron, over thirty Surfbirds, a Dunlin, eight Black Turnstones and three Black Oystercatchers on the rocks not far from the shoreline. We watched several Orcas feeding near the horizon as they moved down the Strait of Georgia. Red-breasted Nuthatch, Bushtit, Ruby-crowned Kinglet, Golden-crowned Kinglet, American Robin, Varied Thrush, Spotted Towhee, Dark-eyed Junco, House Finch, Song Sparrow, Red Crossbill. A Palm Warbler was seen with a Yellow-rumped Warbler at the Nanaimo River Estuary in south Nanaimo. The Palm Warbler was seen along the long Hawthorn Hedgerow on the right of the tall Oak Tree. Eight Trumpeter Swans were seen flying over Buttertubs Marsh in Nanaimo. A Sharp-shinned Hawk was seen on a fence post in the 100 block of Meridian Way in Parksville. 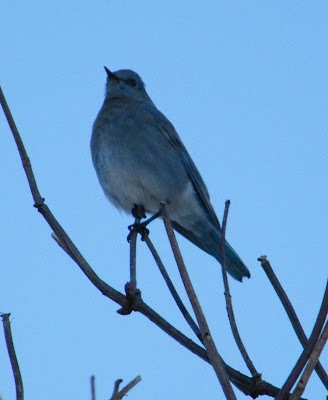 Steller's Jays, California Quail, Spotted Towhees, Dark-eyed Juncos, House Finches, Varied Thrush, Northern Flickers and an Anna's Hummingbird are visiting feeders in along Cloke Road in Ladysmith. Eight California Quail were seen in the 2500 block of Glenayr Drive in Nanaimo. The Tuesday bird went to Columbia Beach. There were light rainshower's for most of the morning, but we were fortunate enough to have a reprieve from them for an hour. The surf was up on Strait of Georgia and the seas were choppy. The highlights of the morning included seeing several flocks of Black-bellied Plovers, a Black Oystercatcher, Black Turnstones and Dunlin heading to the gravel bar at Pebble Beach. Five flocks of over four hundred Bonaparte's Gulls flew past us and a flock of about a hundred stopping at the gravel bar. We saw two Ancient Murrelets racing just above the water down the Strait. Bonaparte's Gulls, Mew Gulls, Ring-billed Gull, California Gulls Thayer's Gulls and Glaucous-winged Gulls gave us good views as they roosted on the gravel bar. Seven birders saw and heard the following forty species of birds. American Wigeon, Mallard , Greater Scaup, Harlequin Duck, Surf Scoter, Black Scoter, Long-tailed Duck, Bufflehead, Common Goldeneye, Barrow's Goldeneye, Common Merganser, Pacific Loon, Common Loon, Horned Grebe, Red-necked Grebe, Western Grebe, Brandt's Cormorant, Double-crested Cormorant, Pelagic Cormorant, Bald Eagle, Black-bellied Plover, Black Oystercatcher, Black Turnstone, Dunlin, Bonaparte's Gull, Mew Gull, Ring-billed Gull, California Gull, Thayer's Gull, Glaucous-winged Gull, Ancient Murrelet, Rock Pigeon, Northern Flicker, Northwestern Crow, Chestnut-backed Chickadee, Bewick's Wren, European Starling, Spotted Towhee, Song Sparrow and House Finch. A large flock of Trumpeter Swans were seen in the fields off Cedar Road in Cedar. One Short-eared Owl, one Northern Harrier, two Northern Shrikes, five Western Meadowlarks, two Cackling Geese and a Lincoln's sparrow were seen at the Nanaimo River Estuary in south Nanaimo. A Trumpeter Swan was seen on the marsh at Hemer Provincial Park in Cedar. A Sharp-shinned Hawk was seen in the 3000 block of Hammond Bay Road in Nanaimo. Two male Anna's Hummingbirds and a Townsend Solitaire were seen feeding in a backyard along Drew Road in French Creek. Guest speaker, Haida Bolton will talk about "Camp Uganda, an educational camp in the Wildlife Education Centre for underprivileged Uganda Children and their parents." Monday November 23, 2009 @ 7:30 pm. The Tuesday Bird Walk on November 24, 2009 will be going to Rathtrevor Provincial Park in Parksville. Meet at the Parksville Beach Community Park near the parking area at the Lion's Playground at 9:00 A.M. or at the main parking lot in Rathtrevor Provincial Park at about 9:15 A.M. Pleas note there is a parking fee at the park. 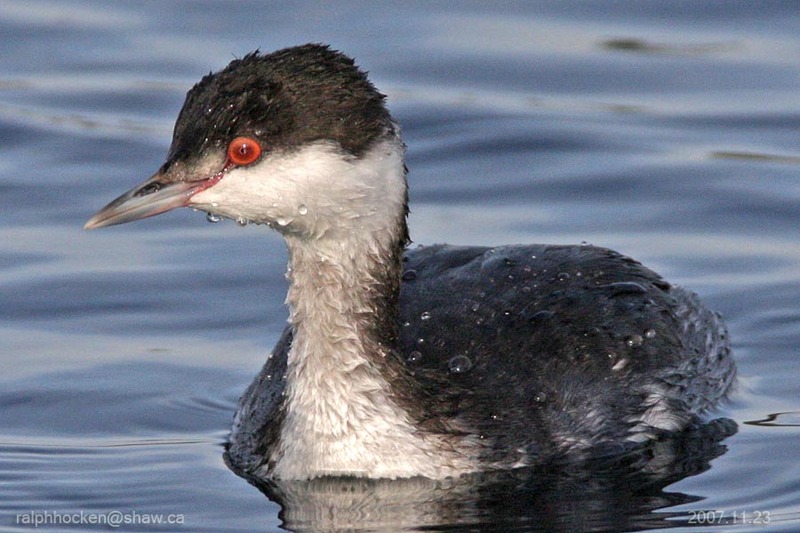 The Sunday Bird Walk on November 29 will be going to Rathtrevor Provincial Park in Parksville. Meet at the Birdstore at 9:00 A.M. or at the main parking lot in Rathtrevor Provincial Park at about 9:30 A.M. Please note there is a parking fee at the park. Bonaparte's Gull at Columbia Beach: Ralph Hocken Photo. The Tuesday bird went to Columbia Beach. There were light rainshowers for most of the morning, but we were fortunate enough to have a reprieve from them for an hour. The surf was up on Strait of Georgia and the seas were choppy. The highlights of the morning included seeing several flocks of Black-bellied Plovers, a Black Oystercatcher, Black Turnstones and Dunlin heading to the gravel bar at Pebble Beach. Five flocks of over four hundred Bonaparte's Gulls flew past us and a flock of about a hundred stopping at the gravel bar. We saw two Ancient Murrelets racing just above the water down the Strait. Bonaparte's Gulls, Mew Gulls, Ring-billed Gull, California Gulls Thayer's Gulls and Glaucous-winged Gulls gave us good views as they roosted on the gravel bar. 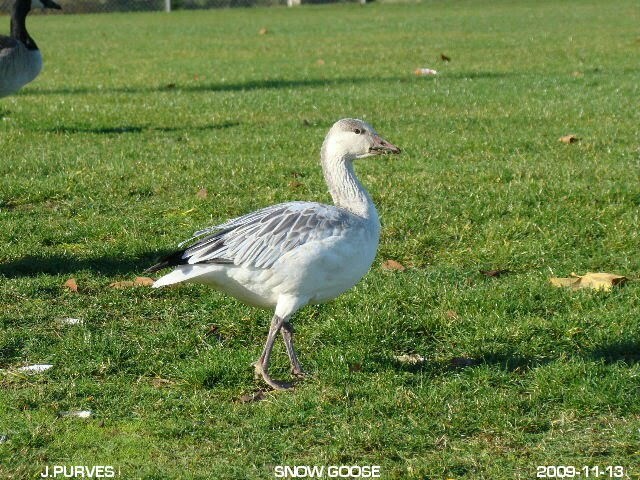 Snow Goose: John Purves Photo. Please remember, when reporting a sighting, to leave your name and phone number, along with the date and location of your sighting. The Sunday Bird Walk went to Buttertubs Marsh in Nanaimo. The rain fell all morning and it was very windy. The highlights included seeing a Barred Owl perched in full view on a branch. A small flock of unidentified Shorebird flew over us. A Wilson's Snipe circled around us for several minutes. Canada Geese, Mallard, Hooded Merganser, American Wigeon, Gadwall, Wood Duck, American Coot, Pied-billed Grebe, Wilson's Snipe, Great Blue Heron, Barred Owl, Glaucous-winged Gull, Northern Flicker, Rock Pigeon, Varied Thrush, American Robin, Golden-crowned Kinglet, Ruby-crowned Kinglet, Chestnut-backed Chickadee, Spotted Towhee, Song Sparrow, Golden-crowned Sparrow, American Goldfinch, Pine Siskin, Dark-eyed Junco, House Finch and House Sparrows. A first fall female Common Yellowthroat was seen in a backyard in Columbia Beach. Three Trumpeter Swans were seen flying over a field off highway 19, between Nanoose Bay and Parksville. One Brant Goose was seen at the Parksville Beach Community Park in with a flock of American Wigeon. One Snow Goose was seen in with a flock of Canada Geese at Winchelsea School Grounds along Renz Road in Parksville. Steller's Jays and Anna's Hummingbirds are visiting feeders along Benson View Road opposite Witchcraft Lake in Nanaimo. An American Dipper was seen in a stream that runs into Witchcraft Lake in Nanaimo. A Chukar was seen alongside Church Road by the three-way stop in Parksville. Four Steller's Jays and Anna's Hummingbirds are visiting feeders in the 4600 block of Lost Lake Road in Nanaimo. An Anna's Hummingbird is visiting feeders along Valewood Drive in Deerwood Estates in north Nanaimo. One Snow Goose and three Cackling Geese were seen in with a large flock of Canada Geese in the Winchelsea School grounds along Renz Road in Parksville. A Sharp-shinned Hawk was seen scouting the feeders in a backyard along Meridian Way in Parksville. Three Short-eared Owls, two Northern Harriers, two Eurasian Wigeon and a Northern Shrike were seen at the Nanaimo River Estuary in south Nanaimo. Four Brant Geese were seen offshore heading south from Yellowpoint in Cedar. the estuary and the flooded mudflats. Three Gadwall, four Northern Shovelers and a flock of Dunlin shared the incoming tide on the mud flats. A male and female Long-tailed Duck, Surf, White-winged and Black Scoters, Harlequin Ducks, Bufflehead, Common Goldeneye, Common Merganser, Red-breasted Merganser, Pacific Loons, Common Loons, Horned Grebes, Double-crested Cormorant and Pelagic Cormorant were playing hide and seek with us by diving and popping up out of the water. Common Loon, Horned Grebe, Red-necked Grebe, Double-crested Cormorant, Pelagic Cormorant, Great Blue Heron, Bald Eagle, Red-tailed Hawk, Killdeer, Dunlin, Bonaparte's Gull, Mew Gull, California Gull, Glaucous-winged Gull, Ancient Murrelet, Belted Kingfisher, Northern Flicker, Pileated Woodpecker, Northwestern Crow, Common Raven, Chestnut-backed Chickadee, American Robin, Varied Thrush, European Starling, Spotted Towhee, Song Sparrow, Golden-crowned Sparrow, Dark-eyed Junco, Red-winged Blackbird, Brewer's Blackbird, Purple Finch, House Finch and Pine Siskin. Three Rufous Hummingbirds were seen visiting feeders along Cosgrove Crescent in Nanaimo. Three Greater White-fronted Geese. three Cackling Geese and two Gadwall were seen at Buttertubs Marsh in Nanaimo. The Tuesday Bird Walk on November 17, 2009 will be going to Columbia Beach. Meet at the Parksville Beach Community Park near the parking area at the Lion's Playground at 9:00 A.M. or at the parking area off Admiral Tyron Bld. at about 9: 15 A.M. The Sunday Bird Walk on November 22, 2009 will be going to Neck Point Park in Nanaimo. Meet at the Birdstore at 9:00 A.M. or at the parking lot of Hammond Bay Road at about 9:20 A.M. The Tuesday bird walk went to the Plummer Road side of the Englishman River Estuary in Parksville. The morning was cloudy with showers but the sea was calm. A Varied Thrush greeted us as we started the walk. The highlights included the sighting of a Red-tailed Hawk perched high in a tall tree overlooking the estuary and the flooded mudflats. Three Gadwall, four Northern Shovelers and a flock of Dunlin shared the incoming tide on the mud flats. A male and female Long-tailed Duck, Surf, White-winged and Black Scoters, Harlequin Ducks, Bufflehead, Common Goldeneye, Common Merganser, Red-breasted Merganser, Pacific Loons, Common Loons, Horned Grebes, Double-crested Cormorant and Pelagic Cormorant were playing hide and seek with us by diving and popping up out of the water. Sharp-shinned Hawk at Lantzville: Ralph Hocken Photo. The Sunday Bird Walk went to the Little Qualicum River Estuary in Qualicum Beach. The morning started with light showers but the rain stopped and it was a pleasant morning for birding. 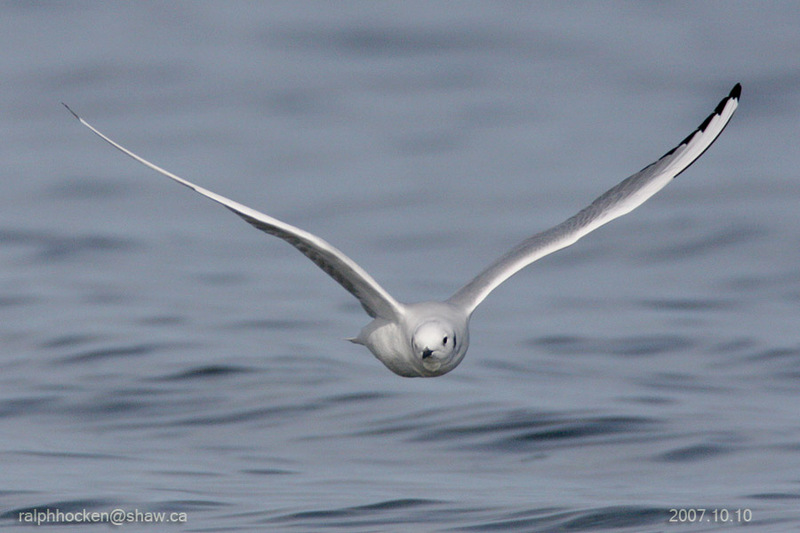 The highlights included seeing a constant stream of thousands upon thousands of Bonaparte's Gulls flying into the mouth of the Little Qualicum River Estuary. We could see huge feeding frenzies of seabirds and gulls stretching along the horizon through the scopes. A flock of thirty Black Turnstones flew past low over the water. There were a large number of Bald Eagles were perched on the high Fir Trees along the river. At least ten Great Blue Herons were roosting on the estuary. Canada Goose, Trumpeter Swan, American Wigeon, Mallard, Green-winged Teal, Harlequin Duck, Surf Scoter, White-winged Scoter, Black Scoter, Bufflehead, Common Goldeneye, Common Merganser, Red-breasted Merganser, Pacific Loon, Common Loon, Horned Grebe, Red-necked Grebe, Double-crested Cormorant, Pelagic Cormorant, Great Blue Heron, Bald Eagle, Merlin, Black Oystercatcher, Black Turnstone, Bonaparte's Gull, Mew Gull, Thayer's Gull, California Gull, Glaucous-winged Gull, Belted Kingfisher, Northern Flicker, Northwestern Crow, Common Raven, Chestnut-backed Chickadee, European Starling, White-crowned Sparrows, Golden-crowned Sparrows, Song Sparrow, Dark-eyed Junco, Red-winged Blackbird, Brewer's Blackbird, Purple Finch and House Finch. 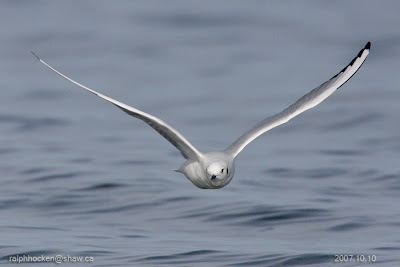 A winter plumaged Black-headed Gull was seen roosting with Glaucous-winged and Mew Gulls south of Qualicum Bay. The Black-headed gull is normally found in Europe, but is fairly common in Newfoundland and is found along the west coast of North America where it joins Bonaparte's Gull flocks. Four Cackling Canada Geese and three White-fronted Geese were seen again today at Buttertubs Marsh in Nanaimo. A pair of Great Horned Owls were seen in Millstone Valley in East Wellington. Four Cackling Canada Geese and three White-fronted Geese were seen in with about two hundred Canada Geese at Buttertubs Marsh in Nanaimo. A Spotted Sandpiper, a Sharp-shinned Hawk and Common Mergangers were seen from Sebastion Road in Lantzville. A Clark's Nutcracker was seen feeding among the drift logs high on the beach at Carmanah Point on the west side of Vancouver Island. The Tuesday bird walk went to the Little Qualicum River Estuary in Qualicum Beach. The morning was cloudy and very windy at times with an occasional glimpse of the sun. The highlights of the morning included seeing thirteen Great Blue Herons resting among the tall grass on the estuary across from the houses at the start of the walk. We spotted twenty Bald Eagles perching on the tall fir trees along the river. There was a very large flock of Bonaparte's Gulls near the estuary. We watched as the gulls lifted from the water to put on their tern like show--moving in a cloud, dipping and diving as they flew. Dunlin and Black Turnstones moved along the gravel bars throughout the morning. There were several Sea Lions and Seals off shore along with Harlequin Ducks, Surf Scoters, White-winged Scoters, Black Scoters, Bufflehead and Common Goldeneye. Dunlin, Bonaparte's Gull, Mew Gull, Ring-billed Gull, California Gull, Western Gull, Glaucous-winged Gull, Pigeon Guillemot, Belted Kingfisher, Northern Flicker, Northwestern Crow, Common Raven, Chestnut-backed Chickadee, American Robin, European Starling, Song Sparrow, Dark-eyed Junco, Red-winged Blackbird, Brewer's Blackbird and House Finch. 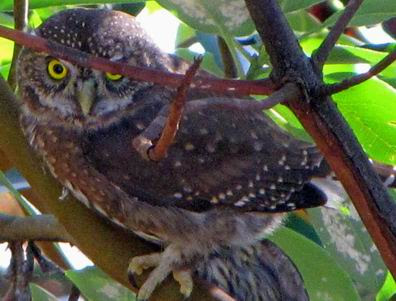 A Northern Pygmy Owl was seen in a backyard along Garry Oak Drive in Nanoose Bay. The Tuesday Bird Walk on November 10, 2009 will be going to the Plummer Road side of the Englishman River Estuary in Parksville. Meet at the Parksville Beach Community Park near the parking area at the Lion's Playground at 9:00 A.M. or at the corner of Plummer Road and Shorewood Drive in Parksville at about 9:10 A.M. The Sunday Bird Walk on November 15 will be going to Buttertubs Marsh. Bowen at about 9:20 A.M.
Northern Pygmy-Owl at Nanoose Bay: Photo by Pat. A Northern Pygmy-Owl was seen in a backyard along Gary Oaks Drive in Nanoose Bay on Sunday November 01, 2009. Red-tailed Hawk: Ralph Hocken Photo. The Sunday Bird Walk went to the Nanoose Estuary in at Nanoose Bay. The morning was sunny and calm until the near the end of the walk, when it turned quite windy. 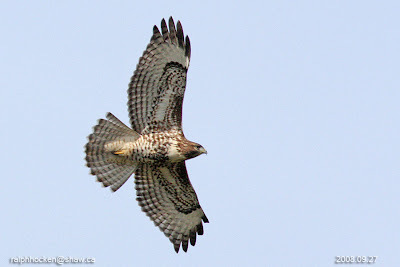 We saw three different Red-tailed Hawks--one was perched in a large bush near the church camp, one was perched in the tall perching snag above a Great Blue Heron and the third Hawk was up high above the tree line being harassed by two Common Ravens. A Merlin flew in above us and circled around and then headed west and disappeared. 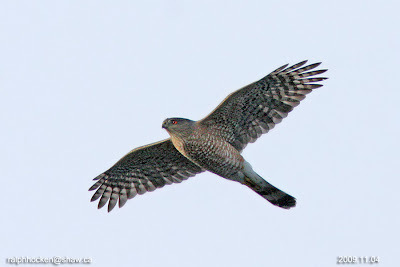 We observed a Cooper's Hawk circling above the trees, moving higher and higher into the sky. Three Dunlin were resting on the shoreline of the incoming tide. We spotted an Eurasian Wigeon among a flock of American Wigeon. Canada Goose, Mallard, American Wigeon, Eurasian Wigeon, Bufflehead, Common Goldeneye, Northern Pintail, Green-winged Teal, Surf Scoter, White-winged Scoter, Common Merganser Common Loon, Pacific Loon, Horned Grebe, Red-necked Grebe, Double-crested Cormorant, Pelagic Cormorant, Great Blue Heron, Bald Eagle, Red-tailed Hawk, Merlin, Cooper's Hawk, Dunlin, Mew Gull, California Gull, Thayer's Gull, Glaucous-winged Gull, American Robin, Belted Kingfisher, Northern Flicker, Northwestern Crow, Common Raven, European Starling, Song Sparrow, Golden-crowned Sparrow, Song Sparrow, Spotted Towhee, House Finch, Dark-eyed Junco and Purple Finch. A Northern Shrike and three Short-eared Owls were seen at the Nanaimo River Estuary in south Nanaimo. An Anna's Hummingbird was seen feeding from garden fuchsia in the 2500 Block of Glenayr Drive in Nanaimo. Two Wilson's Snipe, one Long-billed Dowitcher, two Eurasian Wigeon and an American/Eurasian Hybrid Wigeon were seen at Holden Creek side of the Nanaimo River Estuary in south Nanaimo. A large flock of American Wigeon, Black-bellied Plovers, Killdeer, Black Turnstone and a flock of Dunlin were seen at the Parksville Bay at low tide. Double-crested Cormorant, Pelagic Cormorant, Bald Eagle, Mew Gull, California Gull, Herring Gull, Thayer's Gull, Western Gull, Glaucous-winged Gull, Northern Flicker, Northwestern Crow, Common Raven, Chestnut-backed Chickadee, Bushtit and Golden-crowned Kinglets were seen on the Plummer Road side of the Englishman River Estuary in Parksville. Canada Geese and one Cackling Goose, American Coots, Mallards, Ring-necked Ducks, Greater Scaup and a Hooded Merganser were seen at Craig Bay in Parksville. The Tuesday Bird Walk went to Rathtrevor Provincial Park in Parksville. The morning was partly cloudy with strong winds making the Strait of Georgia very choppy. The highlights of the morning included seeing a flock of Dunlin along the tide line. White-winged, Surf and Back Scoters, Pacific and Common Loons, Pigeon Guillemot and Common Mergansers were further offshore. Inland, near the marsh we came across a large mixed flock of songbirds including Chestnut-backed Chickadees, Bushtits, Red-breasted Nuthatch, a Brown Creeper, Winter Wren, Golden-crowned Kinglets, Ruby-crowned Kinglets, a Hutton's Vireo, Varied Thrush and a Townsend's Warbler. American Robin, Varied Thrush, Townsend's Warbler, Spotted Towhee, Song Sparrow, Dark-eyed Junco, House Finch, Red Crossbill and American Goldfinch. Fifteen Long-billed Dowitchers were seen at Holden Creek in south Nanaimo. A flock of eleven Trumpeter Swans and one juvenile Northern Harrier were seen at the Nanaimo River Estuary, Raines Road side. Guest Speaker Entemologist Evelyn Stokkink will talk about the life of the Ambrosia Beetle. The Tuesday Bird Walk on November 03, 2009 will be going to the Little Qualicum River Estuary in Qualicum Beach. Meet at the Parksville Beach Community Park near the parking area at the Lion's Playground at 9:00 A.M. or at the Viewing Platform on Highway 19A and Garrett Road in Qualicum Beach at about 9:15 A.M. The Sunday Bird Walk on November 08 will be going to the Little Qualicum River Estuary in Qualicum Beach. Meet at the Birdstore at 9:00 A.M. or at the Viewing Platform on Highway 19A and Garrett Road in Qualicum Beach at about 9:30A.M.